Interview with Gina Gordon + Giveaway | Book Lovers Inc.
Stella: Hi Gina, welcome to Book Lovers Inc! Your brand new release A Taste of Trouble just got released by Entangled Publishing in their new Edge line, could you tell us a bit more about the story and whether it is part of your new Madewood Brothers culinary romance series or something completely standalone, but still to do about tasting and desserts? Gina: A Taste of Trouble is a single title that’s completely separate from my Madewood series. However, it does focus on a particular food item, one of my favorite things. CUPCAKES! Stella: Now could you tell our readers what they can expect of A Taste of Trouble? Is it as scorching hot as your Madewood Brothers series or a bit tamer since it isn’t an Entangled Brazen release? His mouth inched closer to the most deprived part of her body, but he never made contact. She fisted her hands against the wall, pushing out her pelvis, inviting him to touch, to taste. To do anything to sate her. “Jake, please.” She lifted one leg and wrapped it around his shoulder, hoping the closer proximity would egg him on. His lips grazed her slit, the slight pressure causing a flutter in her stomach. And when his tongue slipped out to taste her, she nearly melted into a puddle on the floor. Somehow, he knew just what she liked, the right pressure, her secret spots. It was like he’d studied a map of her body. He stroked up and down, in and out, working magic with his tongue. Stella: Could you introduce the hero and heroine of A Taste of Trouble to us? I’ve had a lot of guys hit on me. A LOT. It comes with the territory when you work in a bar. Not once did I ever want to cross the line and pursue anything more than serving them a beer. Until I met Jake. I remember that moment–when all of the air left the room and I was mesmerized by his presence. I knew I was in trouble from that moment and no matter how hard I tried to push him away, it just didn’t work. Yes, he lied. Some women may not be able to forgive that, but the thought of a lifetime without him was far worse than a stupid decision he made before he even met me. I didn’t expect the spark to be literal. I expected a warm feeling, maybe a twinge of excitement in my stomach when I met “the one”, but not an actual spark that knocked the wind right out of me. I want so much to be able to say if I could go back again and tell my boss to stick it, I would. But that’s simply not true. I never would have met Liv. And following through with his stupid plan was the best worst decision of my life. I have a lot of love, and a lot of cupcakes, in my future. Stella: Since A Taste of Trouble is focussed around cupcakes, could you tell us if the hero and heroine were a cupcake, what kind would they be? 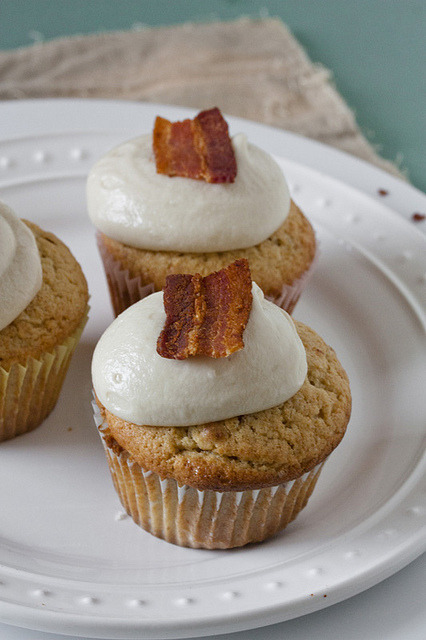 Gina: Jake would be a maple bacon cupcake. It’s robust and rough around the edges but surprisingly sweet on the inside. If Liv was a cupcake, she would be a vanilla cupcake with buttercream icing. The picture below describes her exactly, simple, with a romantic touch. Stella: Thank you! 😀 If A Taste of Trouble was made into a movie, who would be your dream cast? Gina: In my head I picture Jake as Ben Affleck circa the mid-1990’s. Ben was my high school heartthrob and to this day remains in my top five hotties! I picture Liv as a Mila Kunis-type. Cute and sweet but still gives off a bit of an edge. Stella: What made you decide to write a completely independent standalone culinary romance when you already had your Madewood Brothers series? Gina: A Taste of Trouble has been a labor of love for the last four years. It was the first thing I wrote when I made the decision to seriously pursue getting published. In my eyes, there is no connection. The Madewood series is a culinary-focused series and A Taste of Trouble is simply a book with a foodie element. It just worked out that they released so close together. Stella: Now can you tell us 3 reasons why people should read A Taste of Trouble? Stella: Could you please summarize A Taste of Trouble for us Twitter-style (in 140 characters or less)? Gina: Man and woman find love where they least expect it–amidst sweet buttercream. Stella: Can you tell us any behind the scenes secret about the novel (either related to the writing process or how a character/scene turned out way different than it was originally intended to, if any character was based on real life acquaintances, etc.)? Gina: Nancy Arbour, Liv’s mentor in A Taste of Trouble is based on a real person—my cousin who in my opinion has better skills than Martha Stewart. She’s who I pictured immediately when I wrote the character into the plot. Stella: What is your favourite cupcake? Any good recipe you could share? Gina: My favorite cupcake is red velvet with cream cheese icing. I will eating ANYTHING if it has cream cheese icing on it 😀 I’m partial to Martha Stewart recipes. You can find her recipe here. Gina: My Madewood series will continue with three more books. As for this series, I’m working on a couple of things. I’m writing a novella about Patti and Brett, Liv’s friends and some of Jake’s friends might get their own books. Gina: The red velvet recipe I included above….. Well…. I have no idea if it’s good or bad 😉 Red velvet cupcakes are my baking nemesis. I consider myself an excellent baker but red velvet cupcakes get the best of me every time I try to make them. I just can’t figure it out.